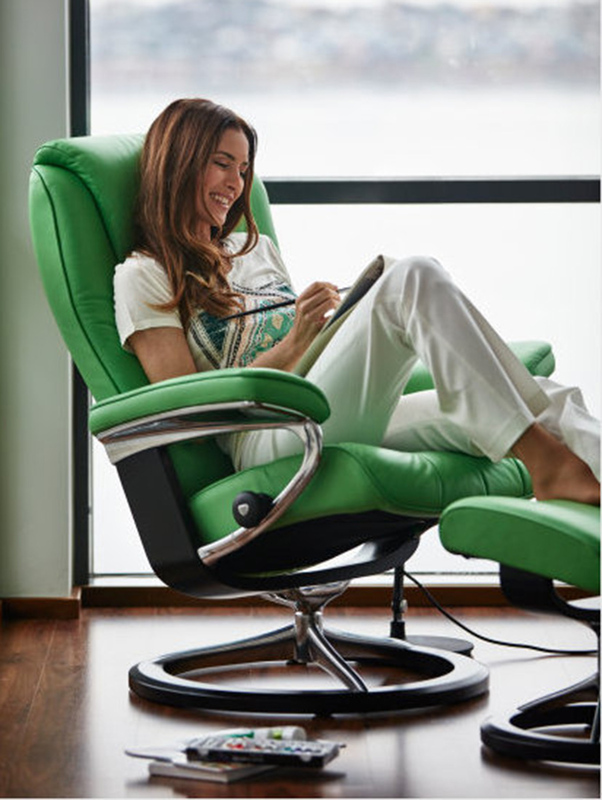 Shop for and buy Stressless recliners online at homefurnishers. It is the easy and safe way to shop the recliner that is designed and made in Norway. We’ve made it simple, safe, and secure. Select a recliner, shop now. Pick a style chair. The most popular recliner styles in no particular order are Mayfair, Consul, and View. But you may prefer your own style of Stressless recliner. There are more than a dozen styles to choose from and each has its own distinctive look and feel. What each recliner shares is the Stressless patented technology and unique comfort. Next, choose the size, large or medium, that best suits your size and body. Stressless does offer small size, but we find that the two sizes medium and large suit most people. Next, choose your base, signature with its stylish chrome and wood accents, or the classic base in beech wood in a choice of seven finish colors. Finally, select the leather and color you like.Since Stressless recliners are designed and made in Norway, we offer the most popular colors for each Stressless style reclining chair. These recliners quick ship in 4 – 6 weeks. Orders on other leathers and colors take longer as they ship from Norway.